“Hey Jude” has new paint & new interior. Most systems have been replacedor refit. New air conditioners, new Teak decks aft, new Teak tables and much more! 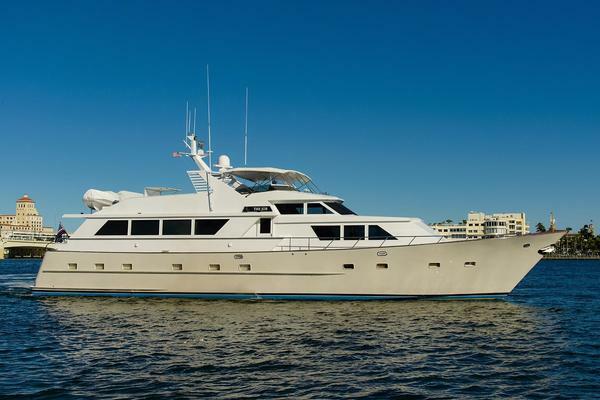 United Yacht Sales New Jersey would love to guide you through a personal showing of this 90' Hargrave Raised Pilothouse 2005. 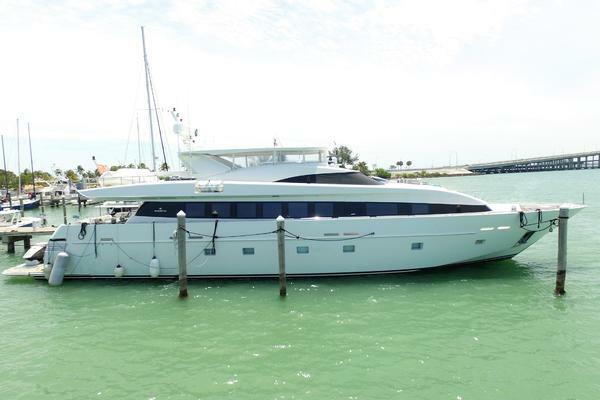 This yacht for sale is located in Fort Lauderdale, Florida and priced at $2,895,000. For a showing please contact us by filling out the form on this page and we will get back to you shortly! “Hey Jude” is one of the finest Hargraves of its size on the water, with almost every system having been replaced or completely updated. She is a Raised Pilothouse motoryacht with a country kitchen forward offering the feel of a much larger yacht. 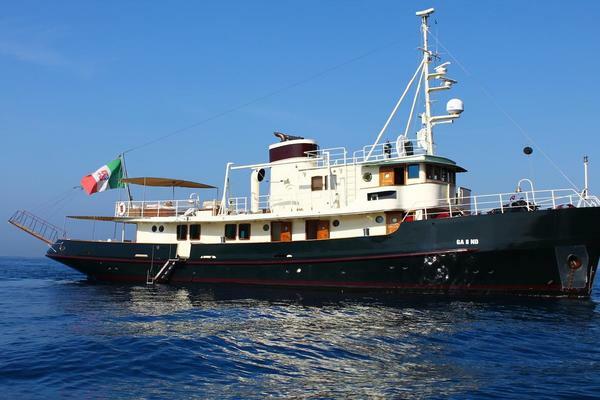 The large aft deck offers seating for eight, al-fresco dining with new Teak table and chairs. Going down and aft from Aft Deck, there is a large Cockpit with a transom door to access the swim platform. The Lazarette area below the Cockpit is air-conditioned. The Aft Deck and Cockpit have new Teak decks with custom built cabinets, forward to port on Aft Deck. Going forward from the Aft Deck you enter the Salon through an electric sliding door. The Salon is full-beam and very open, which offers the feel of a much larger yacht. The Salon has been recently updated (2017) and tastefully decorated for daily living. The entire Salon has been redecorated including L-shaped sofa, ottoman and bar-top with new custom bar stools opposite the sofa which is close from casual conversation. Including with the new décor is the forward Sochi bulkhead, leather bar front, matching ottoman with custom storage under the sofa and new sconces. The Formal Dining is just forward of the Salon, featuring a large new table with 6 new dining chairs. The Salon and Dining offers new audio & video equipment while using Sonas. The Galley has been recently appointed with new galley countertops, new (2017 electric blinds on port & starboard with pleated shades on the forward galley windows). A large U-shaped dinette forward in the galley provides a panoramic view. The dinette seating is new (2017). There is custom storage in the dash below the windshield. The Raised Pilothouse is up several steps from the starboard main foyer. It offers excellent visibility with a full array of electronics. There is a large L-shaped settee with table aft and to port of the helm for comfort while cruising. From the Pilothouse up several steps is the Flybridge. Forward are two large bench seats with helm to port and a large 3-4 person bench facing forward for comfortable cruising. There is a large L-shaped bar to starboard with new counter tops and 3 new Murray Brothers bar stools, with back rests, to port for the walk-behind bar and a large L-shaped settee with two new large teak table tops, which can be raised and lowered. There is additional small settee to starboard with a new teak table. Just aft of the L-shaped settee is a custom lounge area for sun bathing; very nicely designed with small storage below. Forward on the Boat Deck to starboard is a custom Fire Starter Grill (2015) and cabinet with a large grill for cooking outdoors. Unique Tender and Davit layout offer the ability to launch tender off the aft of the boat deck and also pick up toys out of the cockpit. A stylish appointed day head is just forward of the salon in the starboard companionway. If features a marble counter and sole, sconces and custom hand-painted sink with Grohe faucet. With its many large windows, including a forward "windshield," the enormous Country Kitchen style galley and dinette area, both are well laid out and a sure crowd pleaser as a gathering spot. The sweeping panoramic views on three sides are outstanding. All counters are granite topped and the island counter also serves as a dining table, with two built-in swing stools customized, to allow seating at either the center-island or the dinette. A deft blend of elegance and space age technology, “Hey Jude’s” pilothouse fulfills its role as the nerve center of the yacht; offering both practicality and comfort. From the state-of-the-art instrument panel to the navigation corner complete with a flag locker reminiscent of an 18th Century Windjammer, the pilothouse reflects the finest in maritime tradition and technology. Cleverly concealed under the pilothouse is an enormous "doghouse" storage area, complete with shelving which allows easy access to electronic controls. This area also contains seven DirecTV receivers; seating includes the Stidd helm chair and a corner settee (with storage beneath) seating for 2-3 with table. In addition to the flag locker, the navigation corner includes a chart table and bookcase, as well as, a large storage cabinet. There is a cleverly concealed chart holder behind the settee. On either side of the pilothouse helm there are large cabinets and drawers for storage and computer equipment. The stylish, well-appointed master suite is accessed through large double doors. The master stateroom is full-beam and provides ample storage, including dresses on either side of the king berth, with drawers below on each side and two spacious hanging lockers. For entertainment, there is a 42" Samsung Smart TV with DVD player. Music is provided by the stereo system and CD player operated by a custom remote. The huge "his and hers" full-beam ensuite head features a marble-lined central shower with built-in marble bench and dual shower heads. The entire ensuite head is finished in marble and the sink is accented with a Grohe faucet. The spacious VIP stateroom is located to starboard and offers a queen island berth, vanity, ample storage, and a large hanging locker. New Samsung Smart TV with DVD and AM/FM plus CD player round out the amenities. The ensuite head is spacious with a marble counter and shower stall, and the sink is accented with Grohe faucet. The twin guest stateroom is to port. This stateroom can accommodate up to three guests. In addition to the twin berths, which can be joined together to form a queen, there is a Pullman berth. There is ample storage, including a large closet. Entertainment equipment includes a flat screen Sharp TV with DVD, AM/FM stereo and CD player. The ensuite head also features a marble counter, Grohe faucet and has a separate shower stall. The crew cabin, features over/under single berths, and is located forward of the foyer. The captain's cabin is to port and features a queen berth. New flat screen TV (2017); Closet, and a variety of drawers. The captain's and crew cabins have direct access to the shared head. The shared head has a shower stall, marble counter and Grohe faucet. The enormous flybridge offers seating for more than twenty, and is accessed both from the pilothouse and from the stairs leading up from the aft deck. The flybridge is covered by a fiberglass hardtop, custom designed and manufactured by Pipewelder’s Marine. The flybridge is fully-equipped and the helm station is carpeted. There are two 2/person Pompanette bench seats, with storage below each bench and a complete array of instrumentation. The 2009 15 ft. Nautica RIB dinghy is stowed on a cradle at the aft end of the flybridge. The dinghy is equipped with a 60 HP Yamaha engine, hydraulic davit capable of launching the dinghy over the stern on the port side. The decks on “Hey Jude” are well designed to maximize safety at sea, with ample room to carry out the essential ship's activities. The non-skid fiberglass side decks are accessed from watertight doors located at the port and starboard interior companionways. The side decks are wide, with high bulwarks and rails for safety at sea. The non-skid fiberglass foredeck is large, with a Maxwell 4000 stainless steel windlass (rebuilt in 2016 with 350’ of new chain) and stainless steel anchor for easy handling. There is a standing-room on-deck Bosun's locker with watertight door, located on the port side deck with air conditioning running into it. The forward cabin top features a large canvas covered sun pad, with storage on the port and starboard sides. There is also seating at the bow with storage underneath. The full-beam and deep cockpit offers more outside room for entertaining, as well as serving as a platform for water activities and fishing. There are also two cabinets on either side of the Lazarette/engine room door, containing several drawers, new speakers 2017. There is a Gypsea awning covering the cockpit. Complementing the spacious, well-lit engine room is a custom feature not normally found in yachts in this size: a large area lined with built-in cabinets providing ample space for storage of parts, fishing and snorkeling gear. Lazarette/work area: Below the cockpit is a large storage area that has air conditioning piped into it. This is a great are to keep scuba gear and other water toys. Forward of the cockpit is a large washroom, which is full-beam and features a head to port. It also has a second washer/dryer unit, (2016).